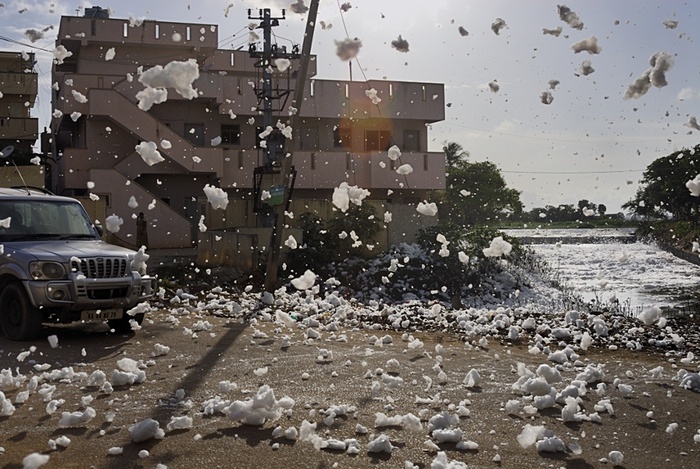 You hear about snow in northern India, but not too much about the snow in southern India. There’s a pretty good reason for that. In the north, that snow blankets the Himalayas and creates a picturesque landscape. 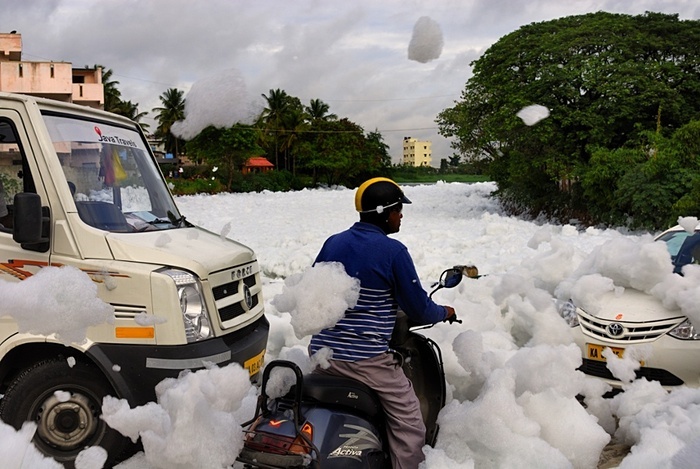 In the south, that snow is blowing off some of the most heavily polluted bodies of water in the world, including the 9,000-acre Bellandur Lake in the city of Bangalore, also known as Bengaluru. 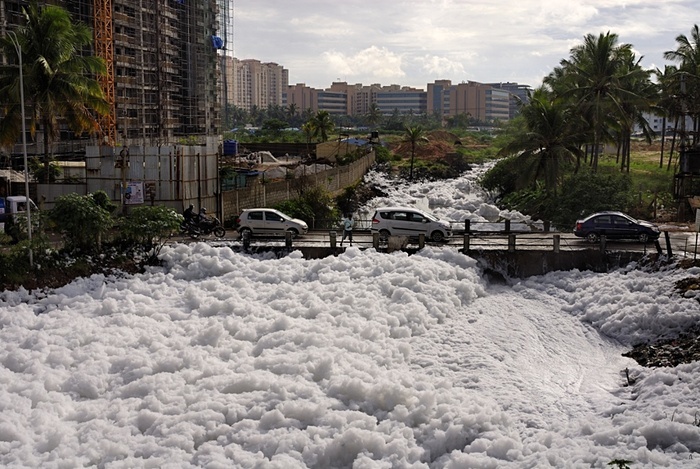 Every year, chemicals in the river mix together whenever heavy rains hit the city, which is an annual occurrence thanks to the monsoon, creating the frothy landscape that looks fun but is actually quite dangerous. 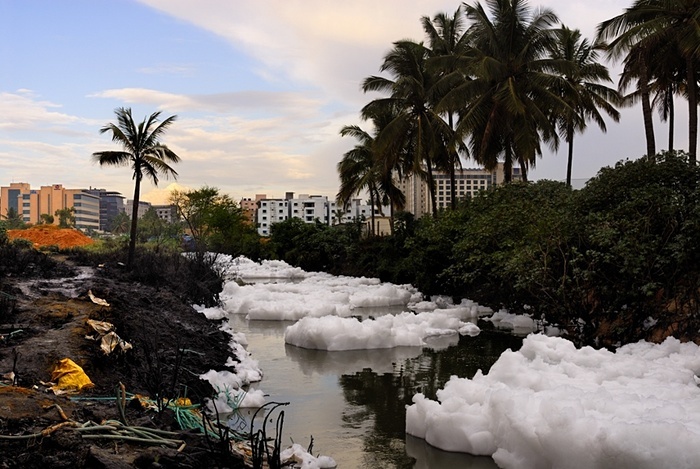 The culprit chemicals in this situation include phosphates, nitrates, potassium, sulfates, and ammonia which are pumped into the lake and surrounding waterways by the numerous industrial facilities located in the city. Many of these companies are part of the booming tech industry that has turned Bangalore into India’s third largest city and the Silicon Valley of the nation. To make matters worse, human waste and raw sewage generated by that large population, topping out at over eight million people, is also pumped straight into the lake. All of this means that, on a good, dry day, even without the frothy white foam dotting the landscape, there is a toxic trail through the city that smells awful. 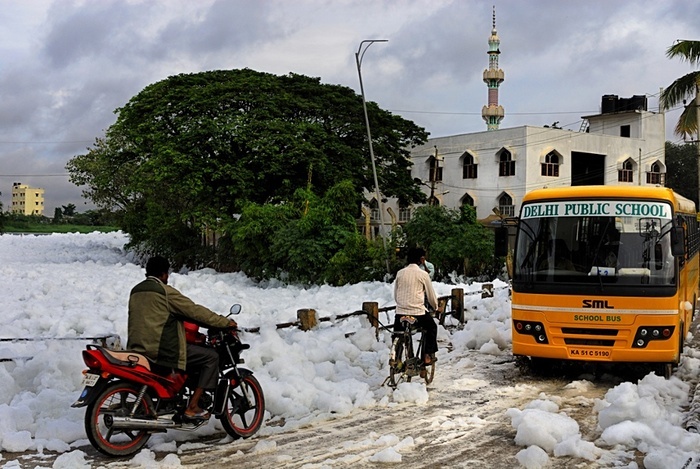 On bad days, however, the foam rises so high that it actually blocks bridges over the river. Local officials have placed nets along these crossings, but they have proven ineffective at preventing the roadways from becoming impassable due to all the toxic foam. At other times, when the roads are passable, drivers frequently complain that accidents increase because of a decrease in visibility. 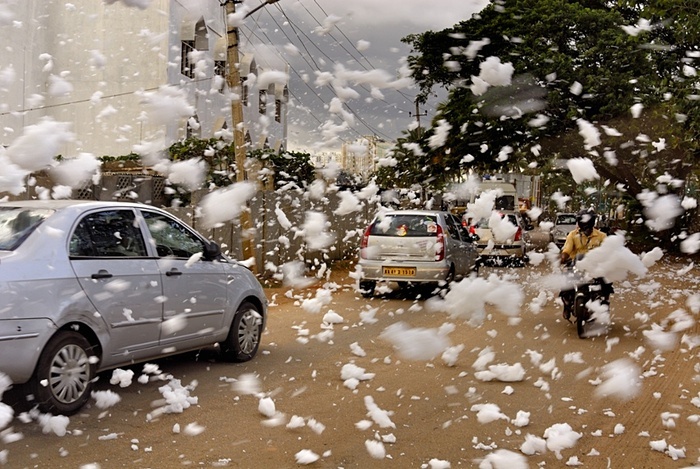 But the most serious issue is that the toxic foam causes skin lesions, burning eyes, and while it hasn’t yet been proven, Bangalore residents have a rate of cancer 84% higher than other residents living in the state of Karnataka. 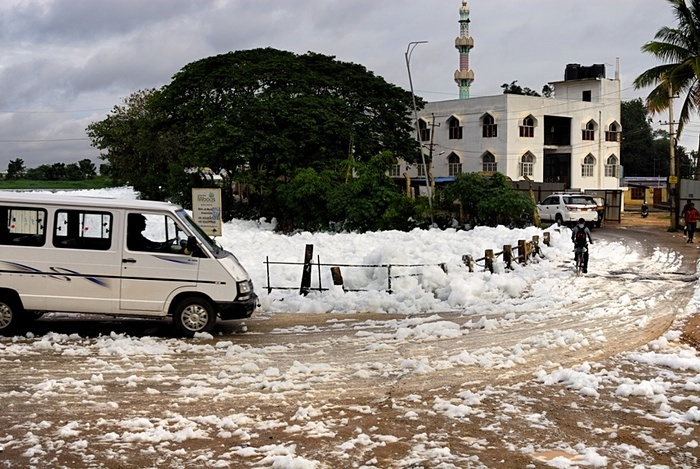 Despite efforts by the residents of the city to get the national government to start cleaning up Bellandur Lake as far back as the year 2000, nothing has changed. A Facebook page has recently helped bring renewed attention to the plight of residents and workers in Bangalore. No doubt their efforts at gaining international outrage for the situation were helped when the lake and interconnected waterways caught on fire twice during the summer. 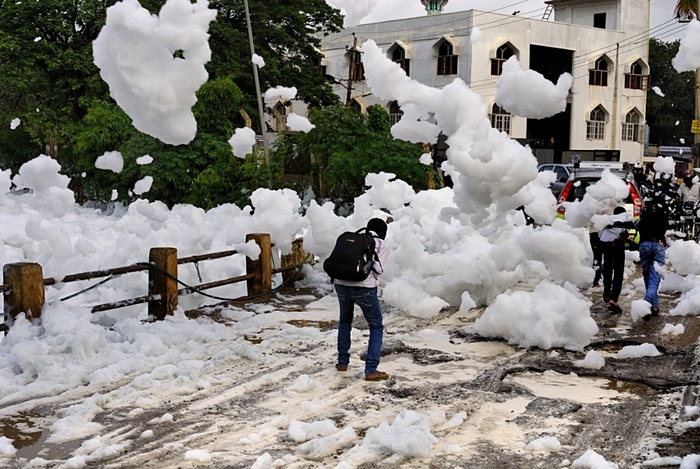 Still no word yet from the national government, but we are sure that the Chinese inventors of a foam cloud making machine for children won’t be starting a franchise in Bangalore any time soon. I'm a former publicist, now pensioner, who lives outside of London with my husband and am enjoying my free time, especially with both daughters gone to university.